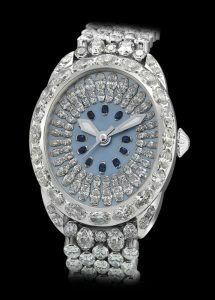 Backes & Strauss are proud to unveil The Royal Regent. True to being a Regent in shape, there are 201 perfectly hand cut oval diamonds, hand set on the dial, the 18 kt white gold case and the bespoke bracelet. The dial is natural mother of pearl, a very elegant blue backdrop for the 12 stunning sapphires acting as numerals, surrounded by 65 perfectly cut oval diamonds. The bracelet is set with a further 107 hand cut oval diamonds and 6 round ideal cut diamonds. A piece of this beauty, taking craftsmen months to perfect, is limited to only five pieces. Dial: Blue mother-of-pearl set with 65 perfectly cut oval shaped diamonds, weighing 3.24 carats & 12 oval shaped sapphires, weighing 0.60 carats. Crown: Set with an ideal cut diamond, weighing 0.09 carats. Bracelet: White gold set with 107 perfectly oval shaped diamonds and 6 round ideal cut diamonds, weighing 53.6 carats.